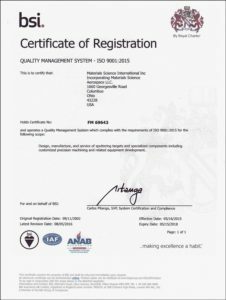 On July 22, 2016, Materials Science International, Inc. (MSI) passed the audit to the new ISO 9001:2015 Quality Management System Standard. On August 8, 2016, MSI was presented with this certification from the British Standard Institution (BSI). MSI is proud to be one of the first companies in the United States to receive this certification.